The M-Audio MicroTrack's LCD display and menus are controlled by a jog-switch on the right. 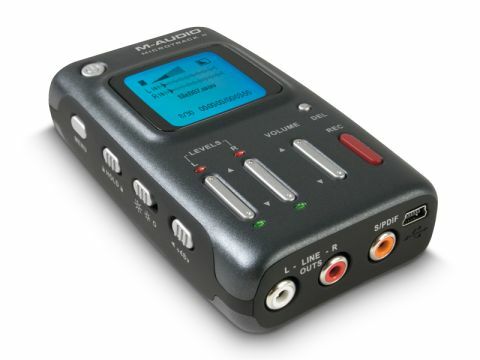 It's easy to set up a recording via the large, toggle switches on its front, and you can either use the small, dual-mic 'T' plug-in supplied with it or plug two microphones of your choice into separate 0.25in jack sockets. We were disappointed with the quality of recordings: they all showed noticeable hiss. When listening to third-party MicroTrack II samples from the web, though, we couldn't hear the hiss – so perhaps ours is a rogue sample. Even so, we reckon that the MicroTrack II is a bit pricey, and we're putting a question mark over its performance.